The Joe’s Basecamp hypoxia room is designed to mimic the effects of high altitude on the body. When you take yourself to high altitude the barometric pressure of the air decreases. The percentage of oxygen in the air stays at 21% but the pressure drops and it’s this ‘driving pressure’ which is needed to get the oxygen into the body and to the cells where it’s needed. A lot of work has been done on the body’s response to low ambient oxygen pressure. Significant changes happen even over short periods of time. If you fly by helicopter to a mountain top the effects are instantaneous. Within a few minutes you are breathing at a higher rate. Your heart rate may go up slightly. If you stay at that high altitude the body continues to adapt and this is called ‘acclimatization’. Over the subsequent days and weeks there are changes in metabolism, shifts in the body’s fluids, compensation in the blood and kidneys for changes in the plasma pH. There will be an increase in the hormone EPO and this leads to the production of more red blood cells. The number and size of the mitochondria, the cellular ‘power-house’ in the muscles increases. These, and many other adaptations, occur at different rates and will be maintained for varying lengths of time. e.g. EPO starts to rise after 1 to 2 hours but decreases after less than 3 weeks. In this way there is no over-production of red cells and the blood does not become too thick. The ‘Hypoxia Room’ where our altitude training sessions take place is a special environment where the percentage of oxygen is lowered to mimic the effects of travelling to altitude. 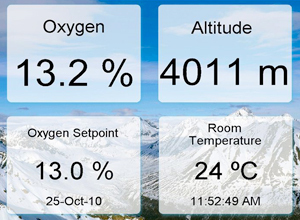 By dropping the oxygen level from the normal 21% to 14% the level of oxygen in the blood, measured by an oximeter, is equivalent to being at an altitude of about 3,700 metres. Exposure to low oxygen levels in the Hypoxia Room for at least an hour several times a week will kick-start the acclimatisation process. The body will switch on the responses and there will be improvement in many parameters. This is not the same as being at high altitude and remaining there for days at a time but by initiating the response some of the discomfort – headache, loss of appetite, poor sleep – felt in the first few days of ascent may be ameliorated. Besides the beneficial effects for those trekking to altitude there are benefits for anyone indulging in endurance sports. Studies have indicated an improvement of 1 to 3% in times for those running 5,000 m. and 10,000 m. races. Endurance is generally improved as is muscle strength – provided strength training has been undertaken in the hypoxic environment. If you are training with an event in mind – a trek, a climb, a marathon, a triathlon, an endurance race – Joe’s Basecamp team will tailor a regimen of IHT (Intermittent Hypoxic Training) to compliment all the hard work you are doing and select the timing for optimal effect for your big event. Heights of some common destinations around the world.